The idea of cleaning a dishwasher might seem strange — after all, isn’t it filled with suds and hot water every day? But those suds, along with tiny bits of food and grease, form deposits on dishwasher walls and components. After a while, not only do these deposits make your dishwasher look and smell less than new, but they also decrease its efficiency. According to experts, you should clean your dishwasher at least once a month to keep it working properly and in top condition. Here are some general steps for maintaining a dishwasher free of odors, debris, soap scum, greasy deposits, and mold and mildew (always check your owner’s manual first for model-specific instructions). 1. Run the garbage disposal first if you have one. The garbage disposal drainage is usually linked to the dishwasher, and to effectively drain the dishwasher you need to keep the disposal clear. 2. Empty the dishwasher, then pull out the removable racks. Sometimes only the bottom one comes out. Take out any other removable dishwasher parts. Models differ, but you should at least be able to unscrew the lower spray arm assembly and lift it out. 3. Fill a sink halfway with warm water, add two cups of vinegar, and soak the parts you’ve removed from the dishwasher. For any parts that don’t fit in the sink, wipe them with a soft rag soaked in the vinegar solution. 4. Check the holes in the lower spray arm assembly. Use picture hanging wire, toothpicks, or shish kabob sticks to remove any debris stuck in the holes. Your dishwasher may have a spraying disc rather than an arm, but whatever the shape, clear the holes. Some newer dishwashers have more than one spinning arm, so be sure to clean the holes in all the arms. 7. Wipe the bottom of the door thoroughly using a cloth soaked with vinegar. In some models debris gathers at the bottom of the door where the water can’t reach. 8. Wipe around the door seal with the vinegar-soaked cloth. To get into the tighter areas, use a toothbrush or Q-tip dipped in vinegar. 9. Clean the inside of the dishwasher using a damp cloth or sponge soaked in a vinegar solution, and wipe the sides, bottom, and door. Never use any chemical cleaners. For stubborn stains use a soft toothbrush and baking soda. 10. Clean the utensil rack if it isn’t removable. Check for any stuck-on food, then thoroughly wash it with a toothbrush, sponge, or dish brush soaked with vinegar. Also wash any non-removable racks in the same manner. 11. Return all the parts to the dishwasher. Place a dishwasher-safe container with two cups of vinegar on the top rack. Run an empty cycle, using a heavy setting with the hottest water. The vinegar will loosen soap scum, food particles, and grease from the walls and racks, and wash them down the drain. A small amount of silt or other deposits may collect in the container, which is normal. 12. Run a second empty cycle to catch anything you may have missed, and to remove any hard water deposits. Add two cups of vinegar to the bottom of the dishwasher, and run it on a low or energy-saving cycle with the hottest water setting. Stop the dishwasher halfway through the cycle, letting the vinegar stand on the bottom for about twenty minutes before finishing the cycle. As an alternative, use baking soda for the second empty cycle. Spread a cup of baking soda on the bottom of the dishwasher, and run a normal cycle on the hottest water setting. The baking soda helps to remove any lingering odors and stains. For stubborn stains, mold and mildew, some people recommend running an additional cycle with bleach. However, this is not a good idea if the dishwasher has stainless steel parts — the bleach will harm the stainless steel and shorten its lifespan. 13. For rust stains, run an empty cycle using citric acid crystals. And for wire baskets where the finish is chipping or flaking off, try a paint-on sealant specially made for dishwasher racks. 14. Wipe the control panel with a damp cloth. Don’t use household cleaners. 15. Clean and polish the exterior. Use warm soapy water and a soft cloth or sponge. For stainless steel dishwashers always wipe in the same direction as the grain of the stainless steel. Rinse thoroughly, and dry with a soft cloth. It’s extremely important to keep the drain beneath the lower rack clear. When unloading your clean dishes, check to see if any food debris is there, and remove it so it doesn’t create unpleasant odors or clog the drain. Then spray the drain with white vinegar to keep it fresh. 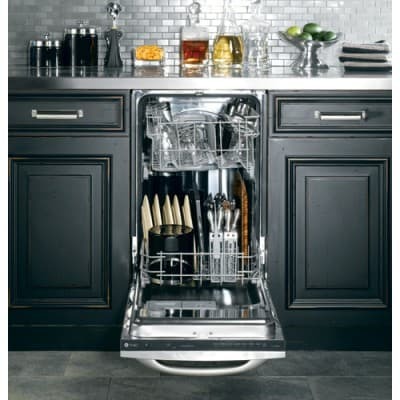 Call C&W Appliance Service for prompt, expert service for your dishwasher and all your other major appliances. Call (855) 358-1496 or (214) 358-1496.